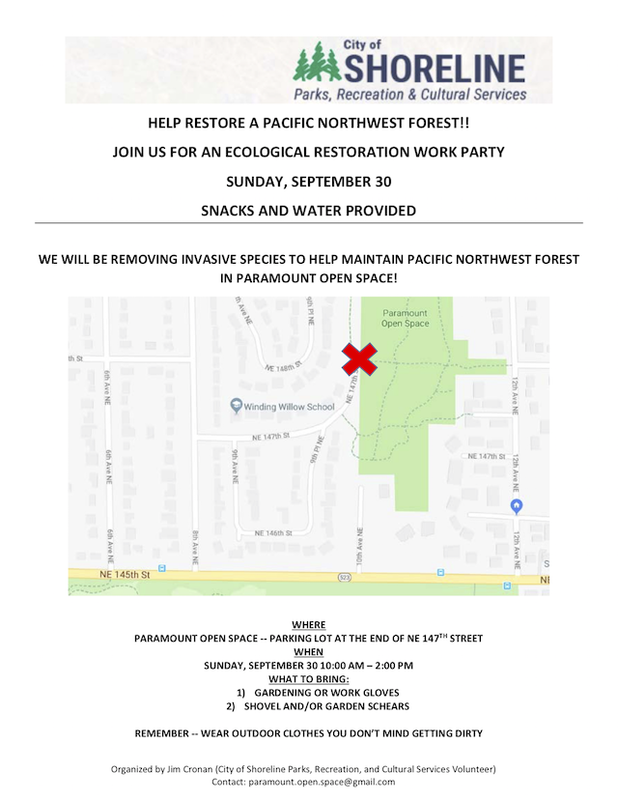 Volunteers with the City of Shoreline Parks, Recreation, and Cultural Services are hosting a restoration work party at Paramount Open Space this Sunday, September 30 from 10am to 2pm. Paramount Open Space is the deeply wooded wetlands a couple of blocks south and east of the Paramount School Park. Meet at the public parking area at the end of NE 147th St. Access 147th St from the west off 8th Ave NE. Bring your gardening tools and work gloves and dress for all weather. Contact Jim Cronan for more information. Email paramount.open.space@gmail.com or call 206-406-9883.